Om is such a sound, especially when focusing on the Mmmmm... sound vibration, which is somewhat like mentally remembering the sound of a buzzing bee. Both inhalation and exhalation might be done smoothly and slowly, while remembering that Mmmm... sound mentally. Om Mantra can be used as a seed vibration alone, or along with deeper meanings. My way of using the mantra is different from yours, because I do not want to fool around with the process. I sit down, and I observe my whole being listening to the mantra. I do not remember the mantra or repeat the mantra mentally, because then the mind repeats many things. Instead I make my whole being an ear to hear the mantra, and the mantra is coming from everywhere. This will not happen to you immediately in meditation, but when you have attained or accomplished something, then this will happen to you. 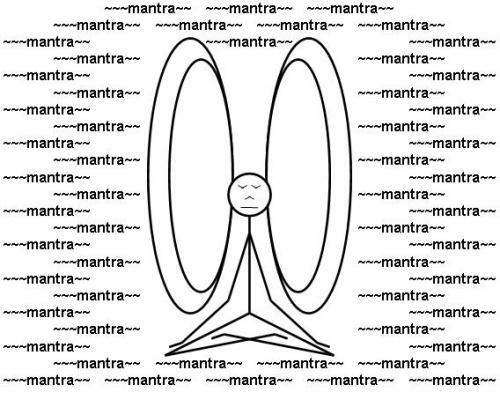 Then, even if you do not want to do your mantra, it is not possible to avoid it. Even if you decide that you do not want to remember the mantra, it will not be possible. Finally, even the mantra does not exist; only the purpose for which you repeat the mantra is there; you are There. The mantra might still be there, but it exists as an experience that overwhelms your whole being, and is not separate from you.